RAF helicopter crews have had to pluck more than 60 villagers from their roof tops and bedroom windows after a river in Worcestershire broke its banks. The residents of Sedgeberrow had to be winched to safety on Friday night. In Evesham a search has begun after man was reported to have fallen into the River Avon as it burst its banks. Firefighters also had to rescue children at Cherry Orchard Primary School in Worcester after water flowed into their building. Two people were rescued from the River Avon in Evesham overnight. Train services in Worcester were disrupted after a landslide blocked a tunnel near Shrub Hill station. Alex Mackie, from Hereford and Worcester Fire and Rescue, said: "Most of the A B and C roads in Worcestershire and Herefordshire remain flooded and we are advising people not to get out of their cars if they're trapped in them, but to try to notify the authorities where they are. "We're unable to get to some of the areas because of vehicles that have been abandoned in these floodwaters." The River Isbourne burst its banks causing dozens of homes in Sedgeberrow to flood. Sixty-two people were winched from the roofs of their homes by helicopter and then lowered to rescue boats. Specialist lifeboat teams were on their way to Worcestershire from Dorset to help with the rescue. Tom, from Stratford-upon-Avon, contacted BBC News Online saying his mother and stepfather lived about 30ft (10m) above the River Isbourne. He said: "My step dad is now trapped upstairs on Winchcombe Road - the main road through the village. "It's only a small river but it is just amazing how it rises. We had a similar problem 10 years ago. "The depth in the lounge is apparently six foot high." 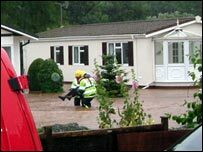 Dozens of residents were also being evacuated from a caravan park off the A44 at Petty Bridge, near Bromyard in Herefordshire, where the River Froome burst its banks, and a further rescue operation is in place at Evesham. In Ledbury a tunnel close to the railway station was also flooded causing severe disruption to trains between Worcester and Hereford, transport officials said. Malvern Link railway station was reported to be under a foot of water and there was water on the line between Bromsgrove and Cheltenham. 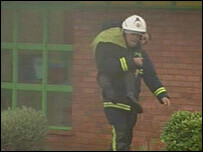 Hereford and Worcester fire brigade said it had dealt with more than 1,000 emergency calls since 1300 BST on Friday. A spokesman said they were also taking calls from areas such as Kent because the system was overloaded in the south of England. They have urged people to call them only if lives are at risk. Emergency teams say they expect the Rivers Wye and Avon to cause more problems and are bracing themselves for several smaller rivers to burst. Police have said there are now only four passable routes into Worcester. Those roads - the A38, M5, M50 and the A4090 to Droitwich - have standing water on them and officers have urged drivers to be careful when travelling. A rest centre has been set up at Evesham Leisure Centre for drivers unable to get home and people who cannot return to their properties. Wychavon Council said more centres could be set up if conditions worsened on Friday night. A spokesman for the Environment Agency told BBC Radio Hereford and Worcester: "Clearly all this water is heading across the county producing a very difficult situation. We are expecting problems. "We're urging people to be very careful and vigilant over the next few days." 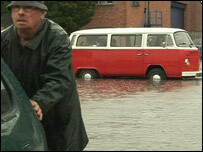 About 200 vehicles were also stranded in Hereford's Merton Meadow car park. Council chiefs helped move vehicles and handed out Wellington boots. British Telecom said on Friday evening about 2,000 customers were experiencing problems with their telephone lines north of Worcester.